My friendship card for the month of May was created for Frances. I knew that this card would be perfect for her. I have stitched a041 which is available from Ann's Paper Art. Threads are Mettler Polysheen 0853 & 5833. 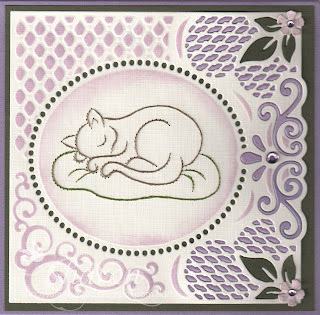 Die is by Find IT trading by Jeanines Art Garden JAD10003. Flowers are Sizzix "Tim Holtz" 661806. Distress ink and gems have also been added. Our weather has turned and it looks like Winter is nearly here. This card was especially created for my Mother-In-Law. Threads are Mettler Polysheen 0605, 2830, 5664. Dies by Creative Expression -Boarder CED6412, LOVE CED9305. 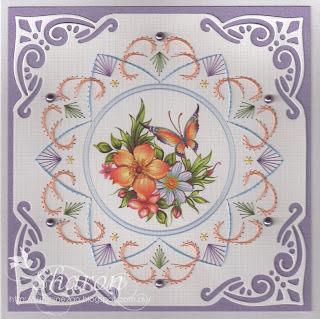 Butterfly die by Marianne Design CR1355. Distress ink and hobbydots have also been added. This card was especially created for our daughters birthday. The pattern is by Ann's Paper Art a609. Threads are Mettler Polysheen 0630, 2830, 5552. 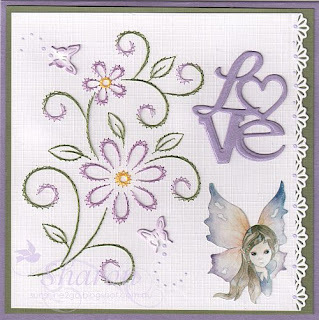 Large Flower LR0406, Dragon Fly LR0461, Hearts CR1323. 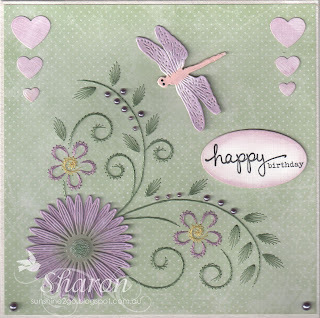 "Happy Birthday" Darkroom Stamps, Simple Sayings. Colour Cloud blending inks by Creative Expression. Micro Pearls and pearls were also added.